We stopped using the word HR at GSOFT (Officevibe’s parent company). Literally, it doesn’t exist as a department name, in anyone’s signature, or in anyone’s vocabulary. In late 2016, the company hired a really special addition to the team, Kahina Ouerdane, who is now the head of Culture and Organization at GSOFT. With her very unique and colourful career background, she explains her perception of the problem with the current HR mentality, and how all organizations – and their people – can benefit from a mind shift away from the idea of “resources”, towards “people” and “culture”. 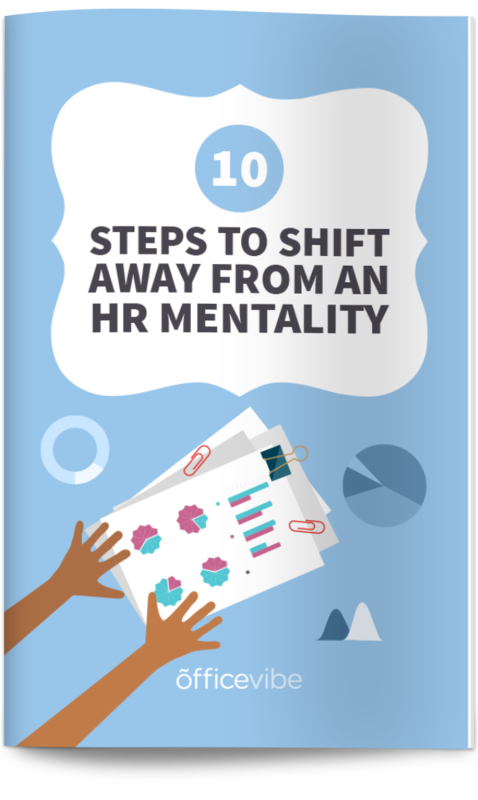 Download this list of 10 simple and fun things you and your team can do to shift away from an HR mentality. Can you tell us a bit about your background and what brought you here? Of course. I worked first as an international human rights lawyer, and then in the humanitarian sector for a few years, in different countries. I was always very much interested in having a positive impact on people’s lives and improving and bettering systems (societies, structures, organizations and so on). The one thing that I noticed early on in my career is the cognitive dissonance that often exists between what an organization pretends to be doing, or their mission towards the external world, and the way that it actually organizes itself internally. I personally witnessed situations where human rights defenders were harassing their colleagues and employees, and where workers of the humanitarian sector were, in certain countries, actively contributing to the local prostitution industry while “saving the world”. This motivated me to tackle such dissonance and work hard at diminishing it. It is about changing the world, one organization at the time. You worked for NGOs and worked around the world. What’s it like settling in at GSOFT? Yes, I’ve worked in Haiti, Thailand, Colombia, Ecuador, Bolivia and the Democratic Republic of Congo. Honestly, working at GSOFT is just like landing in another country. I discovered that every organization is in its own way a new world. Every company has its own culture, language, dynamics and taboos. It gave me an interesting take on the cultural aspect of an organization, but at the end of the day, at the center of everything, just like in society, are the people. What’s your role at GSOFT? My role is here basically to harmonize collective action. That’s pretty much my purpose in life. How can we make people work better together? How can we take violins and cellos and flutes and bring them all together to make a symphony? That’s how I see my work. My title is VP of Culture and Organization, which I created when I started working here. I’m really interested in having a positive impact on people’s lives within my organization, and also outside the organization. GSOFT really wants to play a role as a leader in the workforce, putting human beings and company culture at the center of the organization while still being profitable. Do you think there’s clash between this people-oriented mentality, and achieving ultimate success? You will actually be more profitable by putting employees at the center of the organization. The point is to stop seeing people as resources or as capital and start seeing them as the core and the heart of every organization. This is a mindset shift that has a huge impact in the way that organizations operate. More and more people are getting interested in this nuanced conception of profitability. I saw the other day an upcoming convention in Philadelphia that looked interested, called Conscious Capitalism – Elevating Humanity Through Business. Humanity and business are not mutually exclusive, on the contrary. When we are inspired by where we work, we are more engaged. It opens up a whole space in our brain for creativity. It doesn’t even become about “going the extra mile” anymore. You don’t even realize you’re doing it, so instead, we give two! Bringing awareness and mindfulness to work by cultivating awareness and mindfulness within yourself is where it all starts. What would you say is the inherent problem with the word HR? Having people saying that humans are resources is a contradiction in terms. Calling departments responsible for people operations “human capital” was extremely dehumanizing and almost traumatizing for me. That vocabulary is dangerous. It says that capital is at the center of the world, and there are different types of capital, and humans happen to be one of them. For me, this is seeing the world in a very disconnected way. I think that words are extremely powerful in a world where that’s how we communicate. Now, every time I hear someone pronounce the term HR, I say something, and explain why the mind shift to putting people and not resources as the center is SO important. Calling such departments People Operations, like Google, or Culture and Organization, puts people back at the center of organizations, where they belong. What steps does an HR department need to take in order to make this mindset shift? Coaching leaders and raising their awareness would be the first thing I would do. Because of the way most organizations are still structured, for the most part, it still has to come from the top. Leaders that make that shift will then impact their organizations. But, it’s a lot of personal work. It’s really about your perception of things. Before the logistics of the whole thing are implemented, there are developmental stages that need to be navigated, along with a knowledge of oneself and a consciousness of oneself. And also simply just thinking, what are the downsides of not making that shift? And realizing the perks and advantages if they do work towards making the change. What are the perks of making this shift? Our Employee engagement goes up. We become more dedicated to the job when the mindset of the company focuses on people as real people and not people as capital or resources. When the people of the company are at the center of the organization’s mission and action we begin working harder without even realizing it. The energy also circulates much more in a very different way. Why does a people-centric culture promise harder workers? Whether it’s by offering them unlimited vacations, allowing them to work remotely, giving meaningful feedback or constant recognition, it is about showing them through concrete actions that they really matter. There need to be traits present that are the same traits that exist in our friendships, relationships, and marriages: Honesty, trust, and transparency. Keeping employees in the loop at all times about big company decisions, even sharing the numbers with them, is another way to keep them at the center of focus. Employees need autonomy and a sense of confidence. They should see themselves as entrepreneurs and see the organization as a playground where they have freedom and trust to build and create. How long would it take an organization to adopt this new mindset? Impossible to say. It depends on the organization and where they’re currently at. But is it possible in every organization? Yes, it’s possible. But then, how willing are you? How willing are you as a leader of a big organization to go in depth and make this change and not just change a title. There’s no checklist to implement this into your organization. It’s not a 10-step approach. It’s a whole cultural shift that starts from changing your own perspective. Once organization leaders see the world from a certain standpoint, they can then sculpt the organization from that same standpoint. After you understand the “why” of human value, the “how” to implement it in your organization becomes a matter of operationalization and creativity. I know a lot of companies that have abolished the word HR without truly changing the mindset. They are still within the mental model of treating people as resources. How will the day-to-day role of managers change? To reiterate, the manifestations of this change in the day-to-day are multiple, in terms of how managers talk and listen to employees, the way they give them feedback, the way they allow employees take time off, work remotely, evaluate performance, the space employees have to take on new initiatives, trust, autonomy. What will change for employees? Ultimately, they’ll feel better coming to work every day when they realize they’re not a means to an end, but an end in themselves. Liz Ryan says that we bring ourselves to work entirely. Managers need to help employees feel good, respected and valued at work, and create a space where they can be their whole selves. That’s when their work is the strongest. How do you foresee the workplace changing with this shift? I think it’s already changed a lot. Going back to the idea of bringing your whole self to work. The dream is that there are less politics in organizations. More authenticity and transparency. Genuine human interactions. It needs to be about the common, collective good. That’s my dream. And I think it’s happening already in a lot of organizations, and GSOFT’s new project, Culture Fest, really shows how many companies are on board with this mindset change. What does one need to do to make this shift? How you shift from corporate talk to a real mindset change comes down to vulnerability. How do we connect with people for real? Brené Brown has had a huge impact on my perspective on how to do that through her Ted Talks. How do we learn for real from one another and how do we see the person next to us as an ally. How do we truly believe in the power of collective intelligence and diversity in the workplace? What other changes do you wish to see in the workplace of the future? It’s an interesting question. I think there is still an issue of trust in organizations: trust of people in themselves, in each other and towards the organization. I was pleasantly surprised by how trusting everyone was at GSOFT when big changes started occurring. I actually never saw anything like it before. When I asked employees about it, most of them shared the same sentiment, which was that they know that GSOFT has their best interest at heart, so they trust the organization’s decisions. What a great feeling it is to show up at a work and know you are being looked out for. It makes them want to do the same for your company. What do you think about this shift towards a people-centric work culture? We’d really love to hear your thoughts on this big topic.